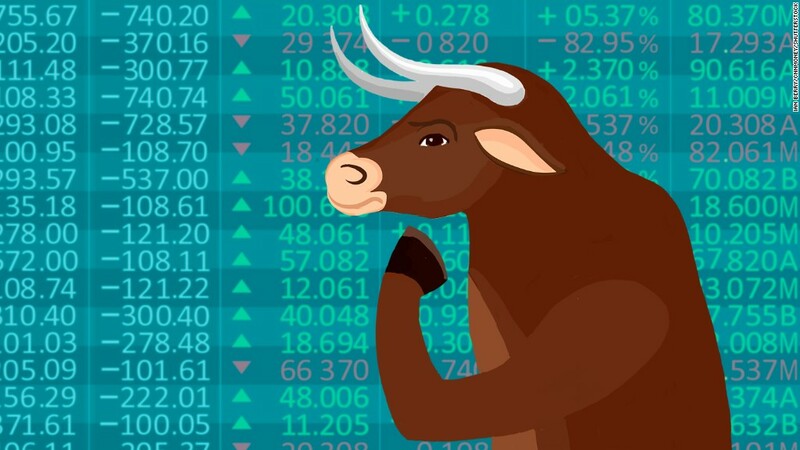 Can this bull run further? There's no shortage of potentially market-moving catalysts right now: an unpredictable U.S. election, turbulent oil prices and ever-changing bets on when Janet Yellen will finally raise interest rates. Yet the American stock market is barely budging, going through an unusually long lull in volatility. The S&P 500 is on track to close on Wednesday with a less than 1% move (in either direction) for the 38th consecutive day. That's the longest stretch since the summer of 2014, according to a CNNMoney analysis of FactSet statistics. To take it a step further, before last Friday, the S&P 500 made a bit of history. The benchmark index went 17 straight days of moving less than 0.75% between the day's peak and the day's low, LPL Financial reports. That hadn't happened on records going back to 1970. 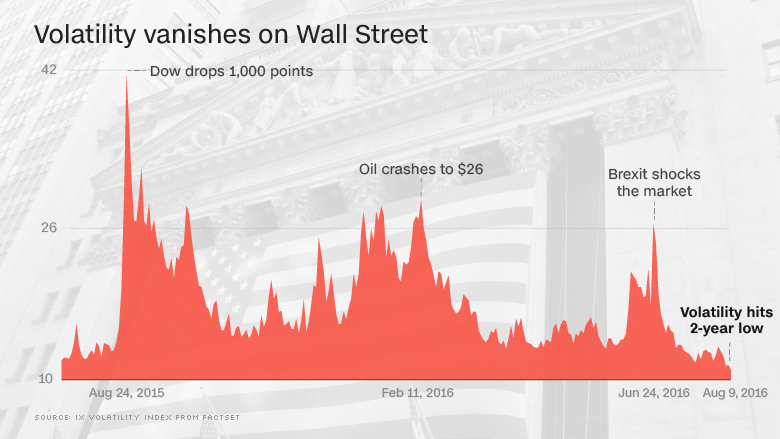 The relative silence on Wall Street is particularly striking when compared with the shockwaves that rippled through global markets exactly a year ago. At one point in August 2015, the S&P 500 experienced six consecutive 1% moves, including three-straight sessions of dramatic 2% plunges. The highlight -- or for most people, the lowlight -- was August 24, when the Dow briefly crashed 1,000 points due to fears about China's economic slowdown. "Historically, August has been one of the most volatile months, but 2016 is anything but normal," said Ryan Detrick, senior market strategist at LPL Financial. Related: Remember the Dow's 1,000 points plunge? Of course, quiet or not, U.S. stocks remain near record highs. And the recent pause may allow sluggish corporate profits to catch up to high stock prices, easing fears that the market is overvalued. It's also worth noting that the quiet period for stocks is coming as trading volumes are very low right now. That makes sense since much of Wall Street hits the Hamptons in late August and investors of all stripes take some time off. "For all investors who took vacations so far this summer, the market has been on its best behavior," Liz Ann Sonders, chief investment strategist at Charles Schwab, wrote in a note. But Sonders doesn't think this will last. "History shows subdued periods tend to be followed by a lift in volatility, and some weakness in returns," she said. In recent days, there are signs that volatility is making a bit of a comeback. The Dow dropped as much as 113 points on Friday after Federal Reserve chief Janet Yellen argued in a key Jackson Hole speech that the case for a rate hike has "strengthened." The blue chips then rebounded on Monday, closing 108 points in the green. The closely-watched VIX volatility index is still sitting at the very low level of 13.4. However, the VIX is showing signs of life, jumping 18% since touching a two-year low in early August. "Long streaks of non-volatile markets don't last forever and we expect the potential for some volatility as we get closer to the election," Detrick wrote. That means any signs that the race between Donald Trump and Hillary Clinton is tightening could spark a move in the markets, as could fireworks at the first debate on September 26. More pressing, a strong August jobs report on Friday could add further momentum behind the idea the Fed could raise rates in late next month. That could finally awaken stocks from their current slumber. That's why Sonders argues against the "natural tendency to become complacent in an environment of extremely low volatility."